My Link to "Echoes From The Hillsides"
In reviewing my hits on this site I can see that many have missed my homespun stories on my other blog. Rather than move them all here, I will let you know that you are missing a lot of stories from rural Tennessee in the early sixties. They stood in awe as they looked up at the massive ship sitting dockside in the early morning sunshine with the word "Lusitania" at the top of it's bow. Even though it had been in service for a year it still looked new as the sun glistened off the top decks that were painted snow white. This day was much brighter than the previous days when they took a ferry from Calais to Dover. After that they boarded a train for the 250 mile trip through the heartland of England to the city of Liverpool. Since they left Calais the day before there had been a steady foggy drizzle, which dampened their spirits, but today was much brighter. Their trip thus far had been trying on the couple with a young son at their side but they knew that their ordeal had just begun. As they looked at the ship you could see the strength in the eyes of Hyppoliet. He was a handsome man with dark hair and piercing blue eyes that showed his resolve regarding the journey they were about to embark on. Beside him were his young attractive wife, Leonie, and their one-year-old son, Kamile. Leonie was small in stature with long black hair and a natural beauty that Hyppoliet found irresistible. She was looking up at him feeling a deep love as he observed the giant ship sitting dockside. She was twenty-five years old and he was twelve years her senior which was a common theme during this period of history. It was easy to see that she loved and respected his judgement with every fiber of her being. Her father had died at an early age and her stepfather was a cruel abusive man. She had found just the opposite of her stepfather in Hyppoliet. He was a strong powerful man but he was gentle and caring in his relationship with both her and Kamile. As they stood at the ship their minds went through the years previous to the present moment. More later - hope you find this interesting. A lot of this is fact but I took the liberty to fill in the gaps. From conversations with both while I was growing up I believe that I am close to how it really happened. I should have more pictures of their life in the next couple of days. They should really help out with their story. Language has always fascinated me. I guess growing up around my grandparents with their mixed languages made me conscious of language both spoken and written. When I entered the USAF my testing indicated that I had an aptitude for learning foreign language. For a kid from the Tennessee hills I was impressed with myself. Studying from the bible God started all this at the tower of Babel when He "confused" the current language and gave each little group a separate language so they would spread out about the earth. Those folks must have had an "aptitude" for language also? As a young teen I remember listening to a World War II vet from the Normandy campaign telling stories at the "liars" bench at the local gas station regarding his confusion with how to communicate with the French people in the area. This line of talk really appealed to me since I knew it was possible that he could have had contact with some of my relatives. At that time we had not made contact with our people there but I was aware of them. Anyway, this guy in all seriousness, was telling about his fondness for the French people and how smart and imaginative they were. He said, "Even their children are super intelligent - even the very small ones speak perfect French." I was waiting for him to laugh but he never did???? Hyppoliet and Leonie both spoke with a combination of English, French, Flemish, and German. In fact Grandpa used the more gutteral German language for his occasional swear words. I was constantly in trouble with my mom because she did not know what the words I was repeating meant but she knew that they were probably bad. My grandpa had to be my favorite person in my life. Even though he died in the early 1960's I still miss him. I remember sitting in his home-made porch swing (grandpa was a craftsman with wood) and looking down on the valley while grandpa puffed his pipe Sometimes we might sit for over an hour without talking. He always used Grainger pipe tobacco that he ordered by the case from Chicago I think. None of that sweet smelling tobacco for him. Grainger had a great masculine aroma but it was not sweet by any account. It was hard for me to be quiet but that's what he liked to do and I respected his peace. I think that's why he enjoyed my company because I never bothered him with unnecessary small talk. He had a great sense of humor but most of the time he appeared serious even though you could still see the gleam in those blue eyes. Now I sometimes wonder what was on his mind back then? Was he thinking of his youth back home in Belgium/France? I will now never know but I will always wonder what stories he could have related to me if I had just pressed him? Anyway, more next time regarding life growing up in an immigrant family. Why a story about a sawmill on a family history site? The answer is that most of the immigrants came over here during the early 1900's and were just beginning to get established in their new country when disaster struck - The Great Depression. This story gives you some idea, in a humorous way, how serious this time in our nation truly was. This is a little story my dad told me and I'm not sure who the characters were - he never would discuss that? Who knows? It could have been a family member? During the great depression sawmills were common places of work for whole communities. From the cutting of the timber through the sawmill operation to the distribution of the product was a very important facet of the community. This was one of the few enterprises that was still operational. This particular small mountain sawmill had about a dozen workers. They brought their lunches in personally marked pails and left them in a temporary shed while they worked. A new man had been hired to the crew but his financial situation was so bad that he could not afford to bring any lunch. On his second day he was so hungry that he went to the shed before the other men on the crew came for lunch. He picked up several lunch pails and finally grabbed the heaviest one and ran into the woods and hid to enjoy his newly claimed “pot luck” lunch. He was surprised to find a claw hammer and three black walnuts in the pail! I hope that this photo is not too small for you to get the points I am trying to make. I wish I knew who these people are? 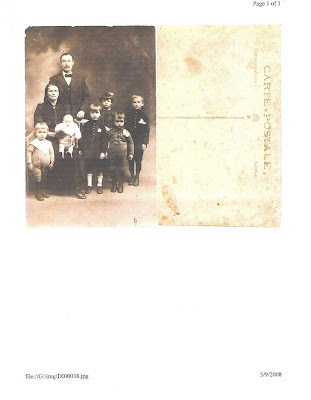 This portrait was on my cousin Pascal’s family history website with hopes that someone could identify the family. He knew that they were part of our family, but who were they? They are a nice looking family. You can easily see that the parents show pride in their family. The lady looks a bit tired but why wouldn’t she? Six kids that close together would probably cause some tiredness. Notice the discipline of everyone in the portrait. Even the baby is participating. How in the world did they achieve that? It stands out to me that two of the kids have little uniform type outfits on that are basically the same. The white baggy socks on the one child seem out of place? I’m sure there is a story there. Did he get his other ones dirty and have to wear his play socks for the portrait? Reckon maybe there was a family crisis prior to the portrait over these baggy white socks? These are the type things that fascinate me. All eyes are on the camera. This is simply amazing! Is it possible that this family has posed for many other pictures? Normal class people would not be posing regularly – could they possibly be of the elite class? Everyone visible in this portrait has clean shoes. The immigrant’s shoes in my “Faded Portrait” poem were worn and run down in appearance. They were wearing nice clothes but their shoes looked like every day work shoes. This family probably didn’t have work shoes? The man shows dignity and class in his suit. His head is back and he looks proud. This tells me that he probably normally wears dresses this way. He shows security in every way. This whole family looks as if they do this all the time? Again, at the time of this photo there were two World Wars in this family’s future. I wonder what happened to each family member? Sadly, their stories we will never know. Before the sadness of this thought overcomes me I realize that they all are gone now. But for an instant in time they are together – peering into the lens of a camera for us to wonder about this many years later. 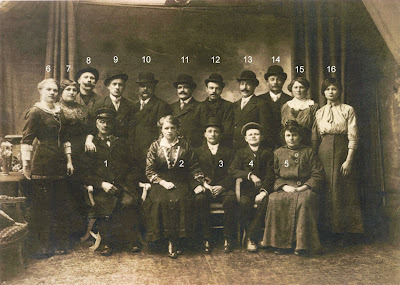 I haven’t studied photographic techniques of the early 1900’s but I really believe that photographers must have attempted to have everyone in the portrait have the same expression. I call it the early 1900’s scowl. Look at today’s photos. Some smiling others looking solemn. Could you imagine someone in 1910 slipping and putting their hand behind some ones head in the “rabbit ears” sign? I have never seen that nor do I think that I ever will. This is a happy scene but you have to realize that these same people will not be asked to survive one World War but two. I wonder what happened to each? Knowing that they were in the center of both.- did they all survive? Less seriously, don’t you just love those hats? Is it possible that someone in the group might have operated a men’s hat shop? Also, I see several neat mustaches in the group. Grandpa Broidioi wore one. In his own humor he called it his “soup strainer.” I remember that he always had a dignity about him even when he was in his overalls. I will always have that image in my mind. I think that we have arrived at the fact that most of these macho guys are grandpa’s family – 9 brothers and 2 sisters. I believe that the top row plus the groom are probably his brothers. His two sisters are harder to pick out but 2 of these young ladies are most probably his sisters. I enjoy looking for stories in each face and each pair of eyes. Even with the “1900’s scowl” their eyes and expressions show a window into their lives. I enjoy studying and imagining each ones situation in life from their appearance and composure as the shutter opened. If a picture is worth 1000 words then I want to write them down. I enjoy pondering and questioning each face while trying to figure out what frame of mind each was in. Have you ever been part of a group photo? Were you focusing on the camera when it snapped? If you are like me your mind may have been many hours and many miles away. You may have one expression on your face but have another one in your heart. That’s what I enjoy looking for in old portraits. Try it for yourself on a group picture that you are a part of. Remember what you were thinking at the time. Then see if you can pick up expressions on yourself and others in the group. We all put on facades for photo shoots. That is a fact. Many would consider this analysis a waste of time but I feel that the past is our link to the future. We must treasure the past. If not, then why have family history sites? I remember as a child wondering about my last name, Brodioi. Why couldn’t I have been a Smith or Jones? I remember young bullies teasing me about my last name and pronouncing it funny and laughing about it. As a six year old I guess that really bothered me. Also, I really felt bad for my grandpa because his name was Hyppoliet August Brodioi. He got his mail as H. Brodioi and for some childish reason I thought that he was probably ashamed of his name too. That could not have been further from the truth. As I grew to my early teen years I realized that he was a strong man who was proud of his name and his heritage. Now looking back I realize that the ones who made fun of me were basically insecure as to who they were and were simply using me to cover their weaknesses. Over the years I have found that most people miss-pronounce the name with an Italian ring to it. Now, finally, I see the humor in that Italianization of Brodioi. I wouldn’t say that my grandma disliked all Italians but she did seem to hold them to a different standard. I always wondered about that? I thought maybe there might have been some political problems between Belgium and Italy that troubled her? On 3 July 2006 this question was answered in a very simple manner. While looking at the Lusitiana’s manifest for their voyage I realized that they were traveling, cramped and crowded for 6 days, with the majority of the names on their page of the manifest being primarily young single men of Italian descent. I figure that in that six day journey my grandma probably had about enough of young macho Italians to last a lifetime. I took the liberty to Google many of the names to see if any had become either famous, or infamous, but so far no matches have occurred. Who knows?? Nothing wrong with Smith or Jones but their base is so broad that tracing family is really tough to do. Now Brodioi is a different animal altogether. I now realize that the uniqueness of the name is one of the things that I love about it. My wife has adapted to it well and is very proud to wear it. Our children also adapted well and seemed to not have the problems I encountered. Here is something that just happened and I find it really thought provoking. Just this week our grandson graduated from kindergarten and as we were in attendance at the school I was looking over the hand out program. I noticed that his last name was spelled Broidioi in the manner that my grandparents used as they entered Ellis Island. I asked my son about the spelling and he said that it was probably a misprint. I thought this was amazing that an error could correct another error that was made one hundred years ago. Imagine the odds against that? One funny and positive example of the uniqueness of Brodioi occurred during my military basic training. Drill instructors are normally not the most fluent individuals. My drill instructor never pronounced my name the same was twice during eight weeks of training. He never asked but his pronunciation attempts always had an Italian flavor. Many times I think that he intended to put me on KP or some other undesirable duty but simply gave up on my name and instead called on “Smith” and “Jones.” My unit had two each of these. While I am proud to be an American, I am also proud of my European heritage. My grandparents came to America to start a new life, not to cut themselves off from their past life. I will do my utmost to insure that our “across the pond” contact is never lost again. I hope that you find my writing to be enjoyable. I promise to not to insult you with any vulgarity or rough language. My stories are written to entertain you with a slice of life that sadly no longer exists. I'm not saying I would want to be there again but looking back gives a warm glow to a good life. As I post a poem I will describe the setting and give some background as to why I wrote it. I feel this gives depth to what I am trying to say. Some are traditional - some are "custom joe," but either way it is my way of telling a story or expressing a belief.